This lovely low maintenance face brick house really talks to you. It has such a beautiful atmosphere that when you walk through the door you feel at home. The house is on one level with 3 decent sized bedrooms with laminated floors that beautifully compliments the built-in cupboards. The master bedroom has an en-suite bathroom with a shower, toilet, basin and a lovely deep bath. The other two bedrooms share a full bathroom with shower, toilet, basin and the same deep bath as the en-suite. 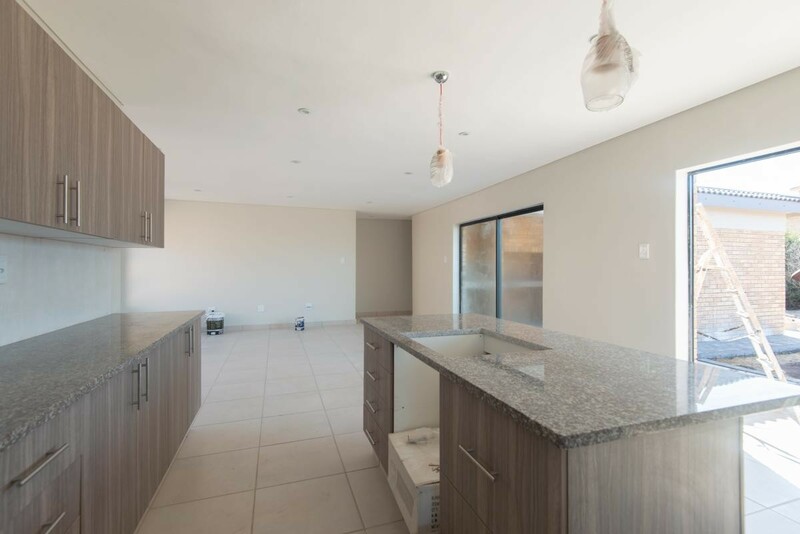 The open plan lounge/dining room/kitchen is the heart of the home, with tiled floors granite tops, plenty cupboards, center island and a separate scullery/laundry. Maximizing the beautiful sea and mountains views, there are glass sliding doors opening onto the stoep and the braai area. The garden is terraced and allows for landscaping and flower beds. It is a brand new house where you have the opportunity to make a happy home. This is truly a lovely home and very well priced. No transfer duty payable, only transfer cost. Make an appointment to view this beauty!